Happy blogiversary to my blog! Happy blogiversary to my blog! 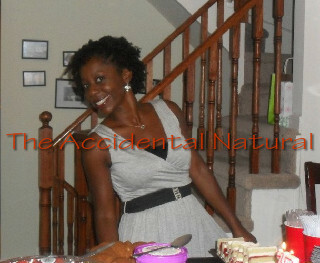 Happy blogiversary to The Accidental Natural! Happy blogiversary to my blog! Yes, folks, The Accidental Natural is one-year-old! I almost forgot my blogiversary, to be honest. Life is busy! This blog has definitely been therapy for me. I started writing the blog in September 2009. I was going through some stuff — life was a bit difficult and I didn’t want to focus solely on what I thought was going wrong. I wanted to do something positive for myself and for my community. So, I started volunteering more regularly with Black Pearls Community Services, Inc. and, because I had been playing around with transitioning to natural, I started reading natural hair blogs, watching tons of videos and trying different things. I started this blog to journal my experiences and thoughts about becoming more comfortable with myself — because for me, that’s what natural hair is: learning to love myself just how I was created. God didn’t make any mistakes on me, but for many years, I just didn’t feel that way. Once I realized I didn’t have to depend on relaxing my hair, I realized something else: I have choices. I can be happy or I can be sad. I can be thankful or I can be selfish. I can be relaxed or I can be natural. It’s not that I didn’t know that, but it became more real for me. While some people would just look at my blog as another hair blog, to me it was and is more than that. I was able to combine my love of writing with my need for hair knowledge and develop own brand of therapy. That’s what started The Accidental Natural. I want to thank everyone who has ever read a post, lurked around, commented or shared a link. I really do appreciate that you are taking time out of your busy schedules to spend some time with me. I’m still no hair expert, but I’m learning more and more about my hair and its needs. Now that I’m heading into my second nappyversary, I’m hoping to share even more. Life still isn’t perfect (whose life really is? ), but I’m counting my blessings. I have family and friends who love me, good colleagues, a roof, food and a job. God has been good to me. Next Post Happy second nappyversary to me! Congrats on your BLOGVERSARY sistafriend! Thanks for sharing your piece of the world with us. I truly enjoy the reads. Wishing you long lasting success and creativity. Thanks for all the love! I appreciate it!